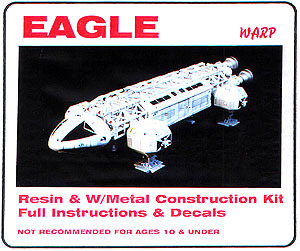 Kit preview of WARP's Space:1999 Eagle . 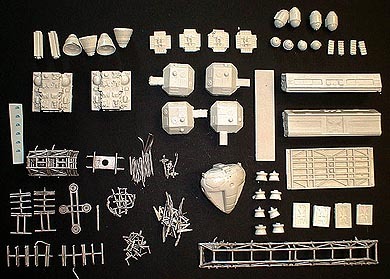 Parts: 44 resin, 50 white metal. Instructions: 5 - four illustrated pages with minimal detail. Decals: 7+ - waterslide Alpha logos are good quality, but sheet is missing any other markings. 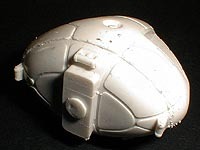 Molding Quality: 8+ - sharp detail, but a few voids (no bubbles) - both resin and metal parts are brittle. Detail: 10 - crisp and complete. MSRP: £49.50 (about $75 USD at the time of writing), available through Comet Miniatures. Overall Rating: 9 - Inspiring in its accuracy and crisp detail, may be a little challenging for a multimedia beginner. the main text to see it larger. ^ It's great to see a command module while detail that wraps all the way around to the rear, including the interconnecting passageway. ^ If you look at the full image, you'll see of the surface irregularities - raised bubbles. This could be due to an aging mold. Whatever the case, cleaning it up should not be problematic. ^ These little gems are one of the biggest reasons to buy this kit over accurizing the ERTL one. These well cast girders surround the connecting corridors for and aft of the passenger pod. They reveal the resin detail within. 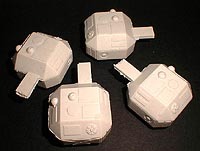 ^ These are the resin cores of the interconnecting corridors. As you look into the girders, you'll see all this juicy detail within. These parts were exceptionally well cast on my sample. ^ The main landing gear pods. Again, the detail here is sharp and accurate, though there's some tricky clean-up work to be done around some of the features. ^ The main engines are reproduced with all the details I know of. The end result should be impressive. ^ The passenger pod displays correct detail on every facing. The two main halves are shown here, though the full subassembly is in about sixteen parts. 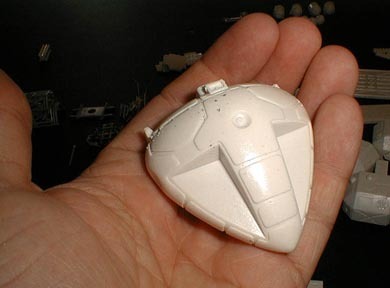 ^ The small thrusters on the underside are properly sized and shaped. ^ A shot of two out of the four main landing gear pads. This is the model I've waited for since 1975. While the growing number of aftermarket accessories for the ERTL are helpful, the kit is so thoroughly inaccurate that you'd literally need to replace every part to end up with a quality reproduction. WARP's original plan was to make an accurizing set for the ERTL kit, but in approaching the subject they realized that nothing short of a full kit would treat the problem. This kit is the result. The WARP Eagle is the same scale as the ERTL kit. This means that other aftermarket accessories, like those from Small Artworks, should be able to be used with this model. Score! It also means any support products made by WARP will be able to be used on the ERTL kit. 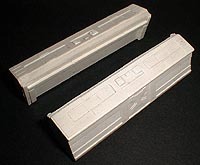 One of the most exciting elements of this kit is that it features all the open girder work around the fore and after connecting corridors. At last! Other nice bits of accuracy include proper profiles on all engine bells, details on the Pod interface surfaces, landing gear/RCS pods with true surface features, and detailed/correct landing gear pads and struts on the passenger pod. In a nutshell, if you're looking for a small scale, affordable, and completely accurate (as far as I can tell with my references, which are reasonably extensive) Eagle, this kit is the first to answer your prayers. Let's get into some more detail. ^ All the kit's parts laid out. Man, what a pile! As usual, let me start with the box. The kit comes in a corrugated cardboard box about the same size as the ERTL Eagle. A color picture of the completed kit adorns the front. Comet Miniatures (distributor for all WARP's products) is in Britain, so my model had to make the jump over the Big Puddle to the States. All the parts came packed in bags and/or padded by styro peanuts. This is may sound trivial, but it's vital to avoid parts breakage! The main materials used in the kit are resin and some form of white metal. The bleached tan resin is both heavy and brittle, like ceramic. It also feels like a ceramic... and can break like ceramic! Even with all the padding, one of the parts got chipped. It's easy to repair, but I urge you to unpack your parts carefully in case there are any chips in the box. You don't want to lose these. The white metal is also very brittle. Two of the delicate frames had broken struts, as well as one of the engine plumbing pieces. Again, fixing them should not be very difficult, but take care in handling the parts - especially if you try to bend any of them back to shape. And don't throw away ANY pieces that look like flash until you're sure that they are (they could be a bit of broken kit part). The resin seemed reasonably well cast, though there were some void problems. It also appears that some resin flakes got on some of the parts before they were fully cured. Given this it looks like the resin parts will need a fair bit of clean-up, but the basic shapes and detail are very crisp. The most daunting thing about clean-up is working with this hard resin. 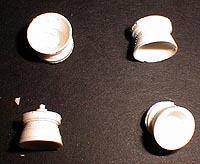 It looks like it could be more difficult to sand and cut than many of the resins seen in North American kits. The metal parts contained some flash, but nothing unreasonable. They should clean up fine with a wire brush and X-acto. Some of the metal detail was quite nice, and the one-piece girder-spine (a recent modification to this kit's construction) is an impressive piece of work. The landing gear struts are also metal which holds the fine details well. In addition to these parts, you get a small sheet of crisply printed, two-color, waterslide Alpha decals. It would have been nice to see a more comprehensive sheet, given the Eagle is covered in small markings, but the Tangents Eagle decals sheet is still there to save the day. Again, this is a benefit of WARP's choice to retain the ERTL kit scale. ^ This image gives you a sense of scale. 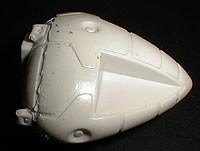 It looks much like the ERTL command module, only with sharper and more accurate detail. Note the proper details of maneuvering thruster dimple. There are ninty-four parts in this kit! Just take a look at the parts layout picture in the previous section. Aside from the main assemblies, you get a baggie of metal bits and one of resin greeblies. These bags are packed with enough stuff to hurt some by swingin' 'em around. With all these parts, it would have been very helpful of WARP to include an illustrated parts checklist. This would help you quickly identify any missing parts, as well as to aid you in identifying parts that are referred to by name in the instructions. Due to the great number of parts and potential difficulty in working the resin, I'd recommend that a modeler have a few multimedia kits under their belt before tackling this one. The biggest disappointment with the kit is the instructions... but if you have to be disappointed with one thing, it's better to have it be something that doesn't actually go into the finished product. The instructions are four pages long - three for construction, one as a painting guide. Each step has an illustration, but some of the details vague or poorly rendered. The call outs are a mix of printed type and hand lettering. Some subassemblies, like the engines, are quite complicated. The instructions say so, but then give minimal text detail. In the end, you'll need to take your time and look at Eagle references as much as possible to make sure of how parts are supposed to fit together. The instructions also refer to a number of parts by name, though there is no guide to explain what each part is called. You can make some good guesses and muddle through, but the instructions could have been more helpful. The painting guide is basic, showing top, bottom, side, front, and back views. Again, if you want accuracy you'll be served by looking at references to make sure you've got all your detail painting and markings placements covered. I think this is a very nice kit - perhaps the best I've ever seen come out of Comet's stable of kit makers. The crisp cast and (especially) accuracy of detail has me really excited to start building this one! While I anticipate a few construction challenges due to the materials, there's no area of this kit that screams for accurizing or extra detail. It's all there! Again, let me point out that open girder work, with all the detail around the connecting corridor housings.. WARP has plans to follow up this release with at least two accessories: a Spine Booster and a Lab/Science/Medical Module. Look for open box previews of those here, as soon as we receive copies. A big thanks to Tony James at Comet Miniatures for providing review samples on request. Manufacturers and retailers, interested in getting your wares reviewed and publicized on a site averaging 2000+ readers a day? Contact us! This page copyright © 2000 Starship Modeler. Last updated on 15 May 2000.